" Let's go to a place where we can be alone and get some rest." They left in a boat for a place where they could be alone. But many people saw them leave and figured out where they were going. So people from every town ran on ahead and got there first. When Jesus got out of the boat, he saw the large crowd that was like sheep without a shepherd.He felt sorry for the people and started teaching them many things. Welcome back to all our staff, students and families. It was wonderful to see everyone return to school after the Term Two holidays looking very relaxed and ready for another busy term. Again, we are fortunate enough to welcome a number of new families to our School community and wish them all the best as they begin their journey at St Joseph’s School. While our Principal, Mrs Carmen Cox, is on Long Service Leave for the first two weeks of Term 3, I have the privilege of acting on her behalf and overseeing the running of the School. If there are any issues, please contact myself through the Primary Administration Office. 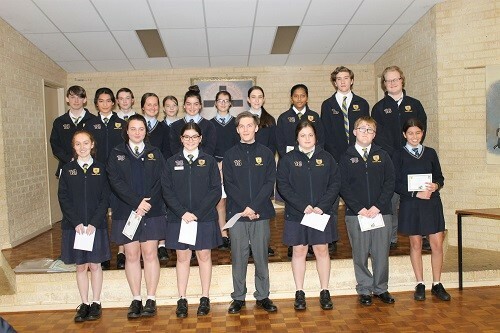 Today, the Secondary Leaders’ conducted the first assembly for Term 3. 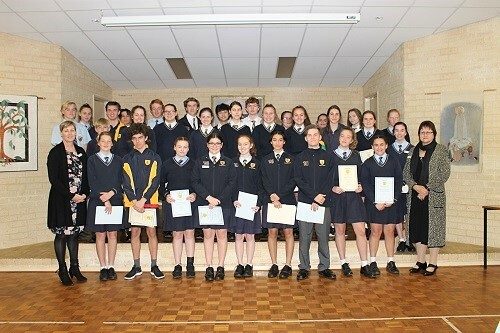 The Assembly included the recognition of the wonderful achievements of our Secondary students with the presentation of the Semester One Awards. These Awards celebrate students who have demonstrated academic excellence and work efforts across all Learning Areas during the first semester. It was wonderful to see such a great turnout of families to celebrate these achievements. A big congratulations to Nathan O’Driscoll (Year 11) who has been named in the 2018 NAB AFL Under 16’s All Australian Team. Nathan recently represented Western Australia in the AFL NAB Under 16’s competition. Well done, Nathan! A new sign has been installed on the Primary Campus during the holidays. This sign incorporates a request to show ‘consideration of our neighbours’ particularly during after-school training sessions. Staff are busy preparing for the Parent/Teacher/Student Interviews that will take place on Thursday 26 July (Primary and Secondary) and Thursday 2 August (Primary only). The interviews are a follow-up from the Semester One reports and provide an opportunity for parents to discuss any concerns they may have in relation to their child’s learning. The Most Reverend Donald George Sproxton, Auxiliary Bishop of the Catholic Archdiocese of Perth, will be visiting our School and Parish on Friday 27 July. Bishop Sproxton will spend time on both campuses interacting with staff and students throughout the day. This week, we officially welcomed Sr Glory, a Servite nun, to our staff. Sr Glory will work in the Early Years classes as part of the Literacy Support Team. We also welcome Ms Nadia Muzzarelli to the Primary Campus in the role of Years One and Two Humanities and Social Sciences teacher. Ms Muzzarelli replaces Mrs Rhonda Oliver while she is on Long Service Leave for Semester Two. A reminder that the Parent/Teacher/Student Conferences will take place on Thursday 26 July (Week 2) and Thursday 2 August (Week 3) between 3:00-5:45pm. These meetings will take place in the St Marcellin Performing Arts Centre with the expectation that students will attend with their parents. A request form was sent home with the Semester One Reports for all parents to complete and return by Friday 20 July. Please contact your child’s classroom teacher if a new booking request is required. Teachers will inform parents of their allocated interview time/s. Welcome back to Semester Two! It was good to hear that most had a relaxing and enjoyable holiday. Now it is time for work as the Year 12's have only 10 weeks of actual schooling left. I would like to congratulate all of the Semester One Subject Award recipients who were recognised at the Semester One Awards Assembly today. 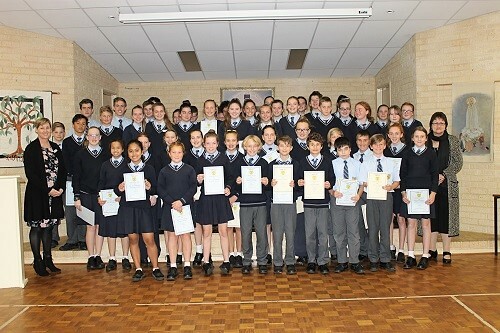 During the Assembly, we also presented Certificates to the students who have completed their MaJEC hours for the year. It was wonderful to have as many parents as possible attend to witness the achievements of their children. A reminder is given that Homework Classes will be held during the Term again for those students in Years 7 to 11. Year 12 ATAR students have been allocated their own tutoring schedule. The Homework Classes will be held every Tuesday between 3:15pm-4:15pm from Weeks 2 to 9. Students must obtain and return a signed permission slip, available from the Front Office, before they can attend. Lastly, a reminder is given to our Secondary students of the invitation by the Northam RSL Sub Branch to a senior Secondary student to speak at the local Remembrance Day Service in November this year. The RSL have asked for students to submit recounts of WWI to be presented at the annual celebration. Any student who is interested in submitting a piece of History, Prose, a Song, Letters (either fact or fiction), details about your relatives depicting what it was like during WW1 and is happy to present these items, is asked to register your interest with Mrs Parnham. All submissions must be in by 17 August so they can be forwarded on to the Northam RSL. It is with great disappointment that I advise that our Term 3 Sporting Schools activities must be cancelled. This is due to funds not being granted based on having been successful with funding for both Term 1 and Term 2 this year. I apologise for any inconvenience. 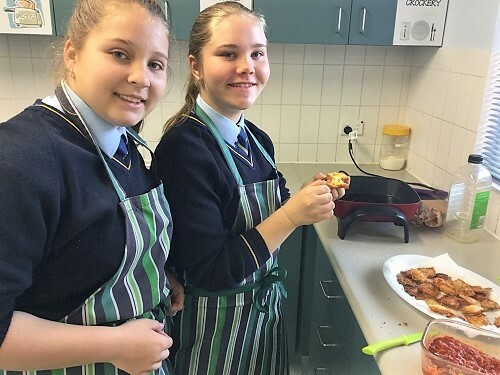 This week, the Food students in Years 9 and 10 have hit the ground running. Each group made their own pasta into Ravioli during class on Monday. This was frozen and then cooked during the next class, along with a variety of sauces. The types of Ravioli made included pumpkin and sage, spicy kangaroo and oregano, mushroom and cheese and chicken and parsley. 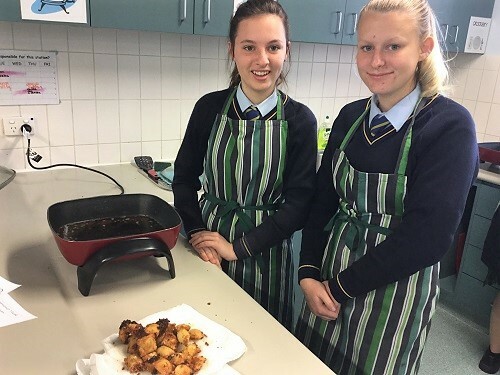 Some Year 9 students fried their Ravioli. Sauces also varied from butter and garlic, to carbonara as well as tomato and chilli. Well done to all our Food students - fantastic cooking! The ACC Athletics Carnival will be held on 31 August 2018 at WA Athletics Stadium. In the lead up to this event, St Joseph’s staff will be providing training sessions for specific events after school. It is highly recommended that students attend training sessions for their nominated event(s) where possible. The Schedule for these training sessions has been provided to participating/nominated students along with a permission letter. Please note that permission to attend training sessions must be returned to Ms Suckling by Monday 23 July. Thank you to all our community members who attended our July Meeting. We held a productive meeting with some positive responses and decisions made by the Committee and the School community. Advance notice is given that the P&F will be running a Scholastic Book Fair during Book Week this term [Week 6]. This will be set up in the St Marcellin Performing Arts Centre on the Primary Campus. Our coordinators for the 2018 Book Fair are Ms Sally Wood and Mrs Holly Robert and they have organised some great activities to run in conjunction with the Book Fair. More details on opening times, purchasing options, etc. will be provided in the coming weeks. The Northam Netball Association will be running their NetSetGo Skills program in Term 3 for 8 weeks commencing on Monday 16 July through to Monday 3 September. The sessions will be held at the Northam Rec Centre on Court 1 from 4.30-5.30pm. Cost is $60 per child and is open to all five and six year olds (born 2012-2013) and any 7 to 8 year olds not already playing and wishing to join in. Northam Junior Indoor Hockey matches will be held for students aged up to 14 years. Registrations for teams and players are now open. Games will be held at Northam Rec Centre from 5.00pm either Friday nights or Sunday afternoons - depending on numbers. Fees are $70 per player plus $2 weekly for court hire. KidSport vouchers are accepted. Junior Indoor Hockey operates under the banner of the Northam Indoor Hockey Assoc. Inc. For more details, please contact Tash James on 9574 0543, tashjames12@hotmail.com or text 0428 109 642. If you are concerned about your child’s teeth, please feel welcome to contact us during business hours. Phone (08) 9622 2385 or email NorthamDTC@dental.health.wa.gov.au A/H emergency phone 1800 098 818 between 6:30pm and 8.00am seven days a week.